Back in San Diego I now would like to catch up my faithful readers on what has transpired during the last part of the West Coast Tour. As I recall the last update was posted from my friends place in Chico. It was a pleasant visit and I look forward to seeing Ricardo again someday and hopefully sooner rather than later. Ricardo did let me know abut the existence of a bus graveyard just off I-5 in the town of Williams, which was right on my way west. 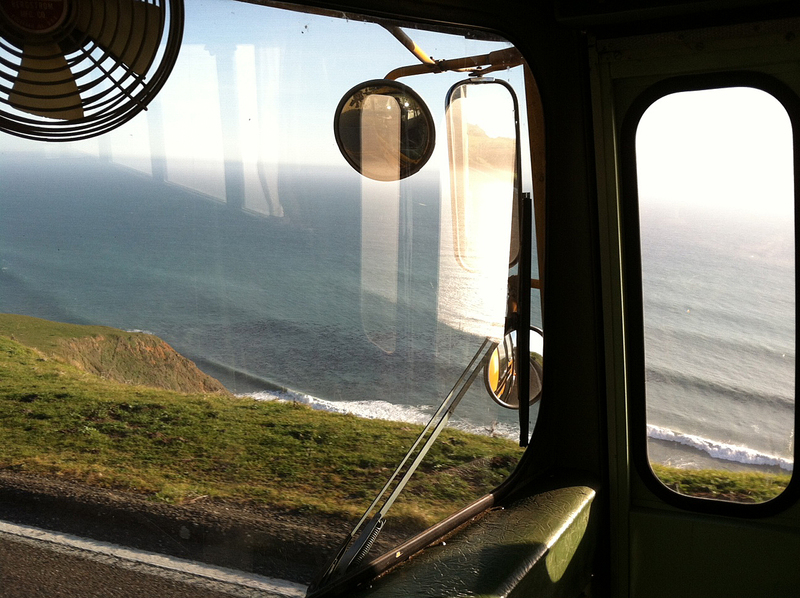 He said there were a lot of old buses there and I was keen to see it for myself. 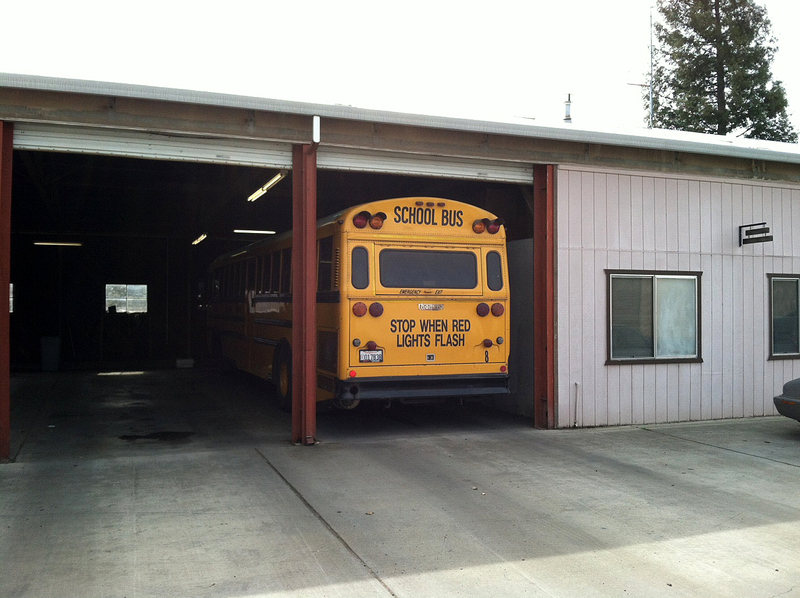 The place is located right by the freeway on the north-east side of Husted Rd. exit. There are at least two dozen really old cool buses there all in various states of decomposition and even an old fire engine in the middle of all that chaos. I decided to make some exposures there and pulled out my Rolleiflex 3.5F, loaded it with Verichrome Pan film and went exploring. Those negatives are now drying in the darkroom and some of the frames came out pretty neat. 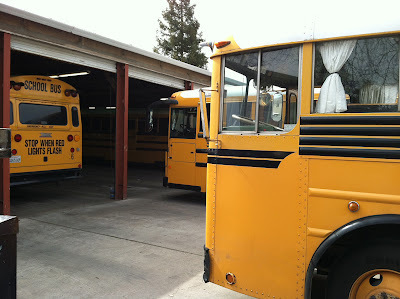 Among all the buses I did not see any Gilligs, which made me think that they either don't break down at all or that people really cherish them and restore them when they do break. I was there for about an hour and did not see a single living being save for a cat or two. 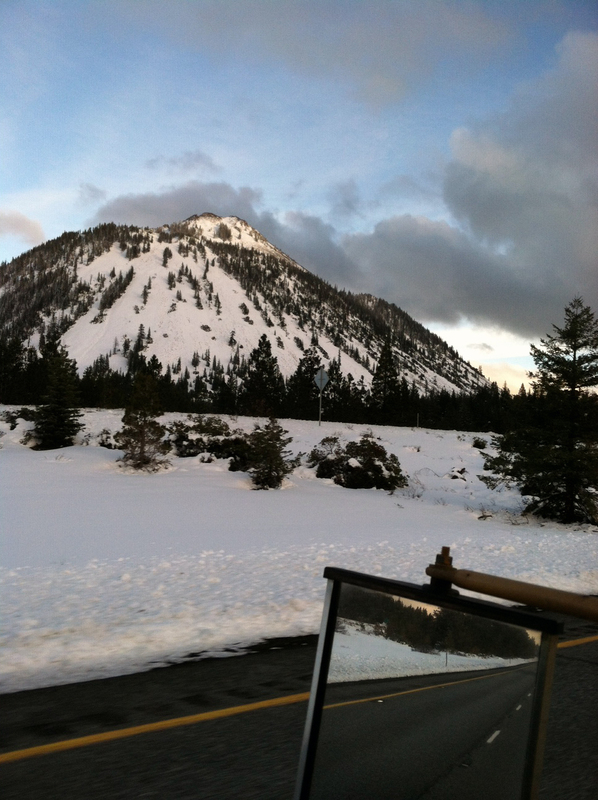 From there I was on my way to Cloverdale CA to present a Magic Lantern Show. There are very few roads that lead from I-5 to the 101 north of San Francisco and I was forced to take highway 20 to the 29. Once you get to 29 there is indeed a sign warning that vehicles over 39ft are not allowed on that road - Gilli is 35ft, so I thought I'd be all right... Little did I anticipate the amount of twists and turns that lay ahead. I swear I am never taking that road again unless I'm in a sports car, in which case it would be very fun and one would have time to enjoy the mountain terrain and the scenery. As it was, Gilli barely made the turns and on one of the particularly cruel right curves a pickup truck appeared from around the corner and was heading straight for me (at that point Gilli's nose was completely in the oncoming traffic lane). I swerved to avoid a head-on collision and, though I succeeded in killing the poor chap in the pickup, I did touch the guard rail with the right side of the bus - the damage was minimal, but there is a new mark on my baby and I feel terrible about it. Someday, hopefully soon, I'll get enough money to give Gilli a new paint job - I'll be sad to see it in a color other than yellow, but I think it would be great to put something definitively photographic on her. Cloverdale is a nice little town, which I have already mentioned in a previous post. 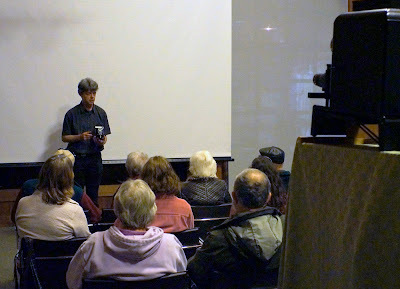 There I stayed with the director of the History Center, which houses the Historical Society that invited me for a show. 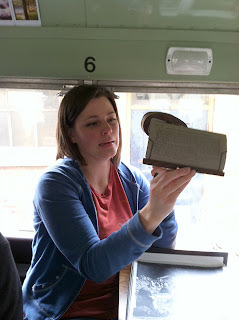 I enjoyed the stay very much and the show went well - there were about 25 people in attendance and I got a lead on an arc-light Lantern with a set of lantern slides that may depict slaves picking cotton. All that is left is to go back there again and help a guy dig through one of his 8(!) storage units... Sounds like fun! 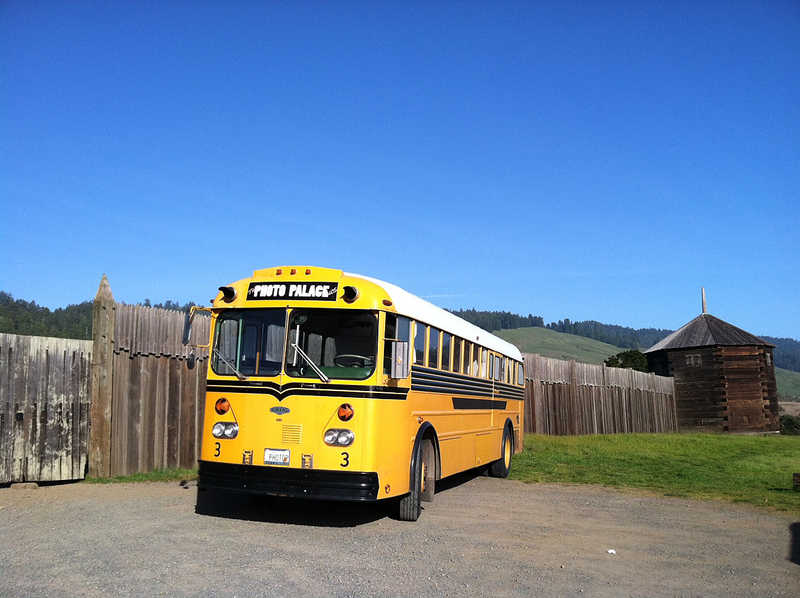 From there is was a short drive to Fort Ross where I had a show scheduled the following day. On the way I once again stayed with Barbara Hoffman, the woman responsible for turning me into a Traveling Lanternist. Too bad the visit was rather short as I always enjoy the company of her and her husband Gary. Fort Ross was awaiting and I knew it was going to be a short, but grueling drive. The Fort is an old Russian encampment and was occupied by them in the 19th century, so there is a lot of history there and I was glad to have a chance to do a presentation at such a prominent location. Fort Ross is also located directly on the coast of California, right on the side of highway 1 - quite possibly one of the most beautiful drives in the world. Aside from being a gorgeous piece of civil engineering, highway 1 is an intensely windy road with quite a few hairpin switchbacks, blind turns, steep ups and downs and all the rest that makes driving a joy for sports car owners, but hell for buses. 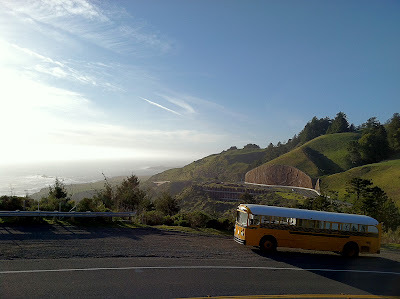 I only had to go about 20 miles each way on it and took it extremely slowly and cautiously, managing to neither fall off a cliff into the ocean nor damage the bus or any other cars that were met along the way. plenty of soft chairs and a giant screen. After Fort Ross I headed back to the Bay Area and spend one night back at Kirill Krylov's place in Pacifica. As I mentioned before, Kirill is an excellent photographer and it was my joy to hear that my previous visit has given him the motivation to finish outfitting his basement as a darkroom. It is now functional and ready to go! 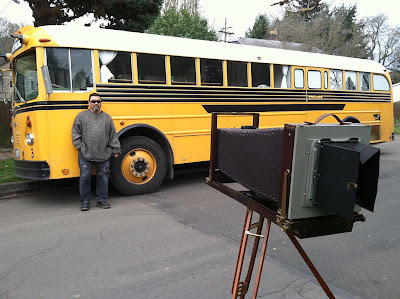 After that is was another short drive to the house of Lee Kalem - Ryan Kalem's father and the man whose electrical skills and wonderful wood shop came in so handy during the initial construction of The Photo Palace Bus just about a year ago. Lee was kind enough to help me fix the last non-functioning light in the presentation area of the bus - turns out that a wire came loose and was shorting out the system, which burned out one of the transformers in it. Lee performed a beautiful soldering operation right on board of the bus and now all the lights are working as they should and we are ready for some night-time presentations. Ryan got home soon after my arrival and we went to check out his new darkroom. 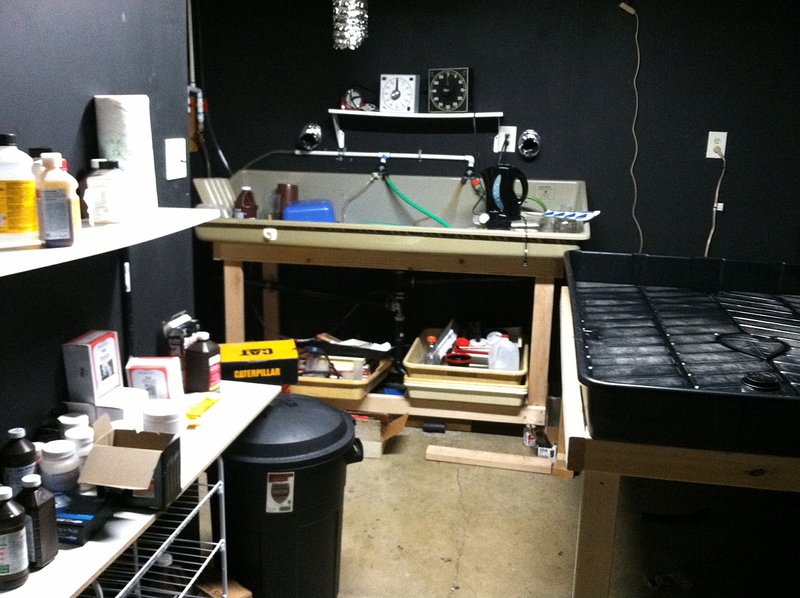 He is quite a craftsman and spared no expense when it came to building his darkroom from scratch. I hope he and his girlfriend Kat will make excellent use of it. 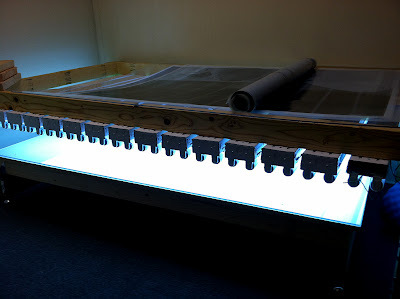 Ryan's enormous UV exposure unit for alternative printing. The darkroom space is fit for king-size prints. accompanied by a Saunders 4500. The appearance at Cabrillo College in Aptos was next on the agenda. I was invited there by the Arts Guild and the event was organized by Carmina Eliason, who has been following the development of The Photo Palace from the start. Gilli was prominently parked right by the arts building and we got a lot of visitors all through the day. A beautiful late Victorian room in the Sesnon House, build at the turn of last century, was used for the Lantern Slide presentation. Quite a crowd showed up because Carmina and the Arts Guild did a fair share of advertizement, 75 chairs were all filled up and there were plenty of people standing and sitting on the floor too. The beautiful room in Sesnon House. 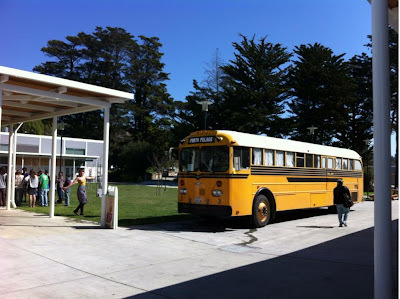 Gilli on campus of Cabrillo College, image courtesy of Carmina Eliason. The next day I had to be at Evergreen Valley college for the last of the scheduled events. There I parked a bit away from hustle and bustle of campus in a large parking lot, so there were fewer visitors that stopped by through the day. Along with a Magic Lantern Show and bus visits I also presented a few lucky and adventurous individuals a chance to try their hand at making tintypes. It was NOT a workshop, because with my amount of experience I am not qualified yet to call myself a teacher in that area, but it was more of a 'wet plate experience'. All in all I think it went OK - only 3 people out of 5 that sent their RSVP showed up and that was good because it took all the 1.5 hours allotted for that activity for each one to make a plate of their own. I am beginning to really like the wet plate process and am looking forward to practicing it more now that I am back in San Diego. Gilli is going to make a perfect Wet Plate Saloon - the amount of water that she carries may be considered minimal required for gelatin silver printing on location, but wet plate requires much less washing, so I'm good for 6 sessions or more. 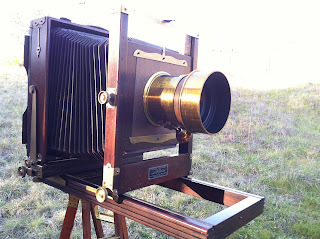 Speaking of wet plate - on this trip I have picked up a couple of absolutely awesome brass lenses from late 1800s. One of them was purchased on my way back from that same antique shop in LA where I found the French WWI negatives still hiding in a stereoscopic camera. It is a beautiful Rapid Euryscop series 7 with a Benster pneumatic leaf shutter mechanism and I can't wait to figure out a way to fit that giant retaining ring onto some sort of a board that would fit on my 8x10 Kodak 2D. The lens having a 24in focal length should make it perfect for some close-up portraits - Large Heads as they called them back in the day. The other lens, a gorgeous 10in Darlot with an astonishing F-stop of 3.6, was traded along with another Kodak 2D for three Majestic tripods. So now I again find myself with more than 1 Kodak 2D - in 2002 I actually somehow got up to owning 4 of those monsters... So if anyone reading this wants to buy the extra one from me, do drop me a line through email and I can send you pictures of it. Here is the Darlot mounted on the 2D. Pictures of the Voigtlander to come later. 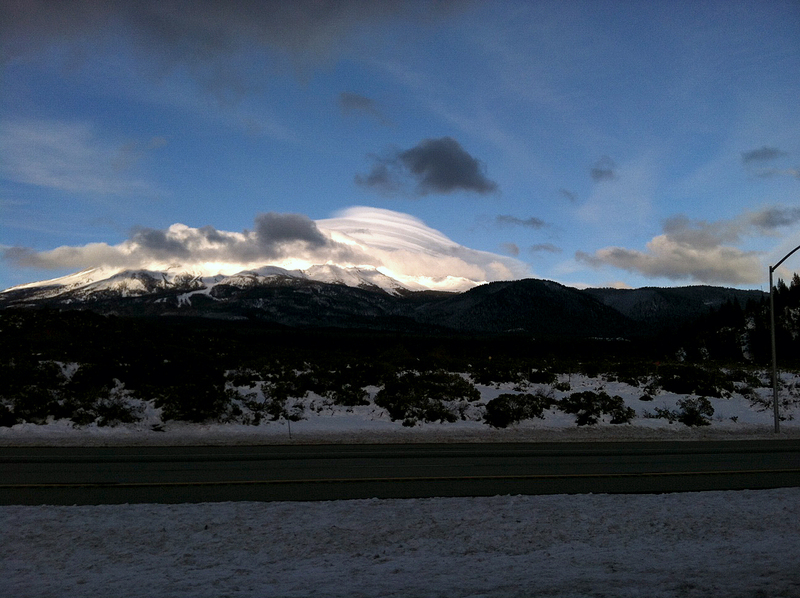 The way back to San Diego was uneventful except for one happy occurrence. 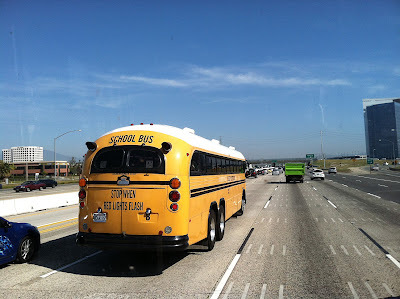 I like driving in LA (when there's no traffic, which is actually pretty rare) because almost every time I go there I see old Crown buses that are still kept up and on the road by some upper class school districts. Being true classics like my Gilli and they really do look great barreling down the highway. This time I was happy to see one passing me by going north and then another one that caught up to me from behind, passed me by for a little bit, but they fell back again and followed us for about 10 miles. Here are a couple of pictures of the meeting of the giants. 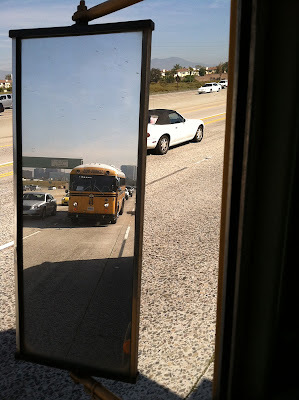 I bet we looked pretty cool - like we were going to some vintage bus show. What's that in my rear view mirror? and I must admit that Gilli's dash puts that Crown to shame. Still these Crowns are really nice and I'm glad to see them running. To summarize - I was on the road for exactly 4 weeks. During that time 7 Magic Lantern Shows were given, 3 college campuses were visited, one wet plate photography workshop was taken by me in Portland, I caught up with two dear friends whom I have not seen in years and many people all across California and Oregon got to see Gilli and our history of photography display, which has been augmented with a carbon and gum bichromate prints. Important to note is that this second trip (short as it may have been) actually succeeded in paying for itself - I made no profit, but at least I didn't have to spend all my savings (of which there is really none left after last year's construction and trial run to Maine). Now I am going to start planning the second cross-country trip with hopes of it also financing itself by Lantern Shows, print sales, presentations and workshops. I am hoping to depart in May and am probably going to take the northern route to Washington (a state that I have been promising to visit since last summer) and then eastward to Maine before heading south to Florida and coming back to beautiful California sometime in autumn. I think that route will give me more time on the road without having to worry about hitting foul weather while making it across the Rocky Mountains. I would like to thank each and every person who has contributed to this journey in any way from financing it through Indiegogo (those funds will now go toward the cross-country trek) to helping me set up events and hosting me at their houses. I could not have done this without you and I am deeply grateful for all your help! Thank YOU! A lot has happened in the past few days and I don't know if I'll be able to describe it in as much detail as I would really like to right now because of how tired I am. 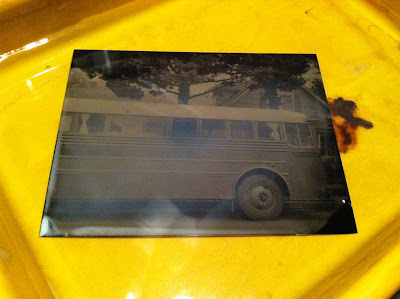 All I know is that today (technically yesterday as I'm writing this after midnight) I made a tintype picture all on my own using the darkroom in The Photo Palace Bus! On Wednesday I arrived to Corvallis and stayed in a lovely company of Julia Bradshaw and her husband John. I met Julia at San Jose State University, where she was getting her Masters degree in Photography while I was a lowly undergrad. 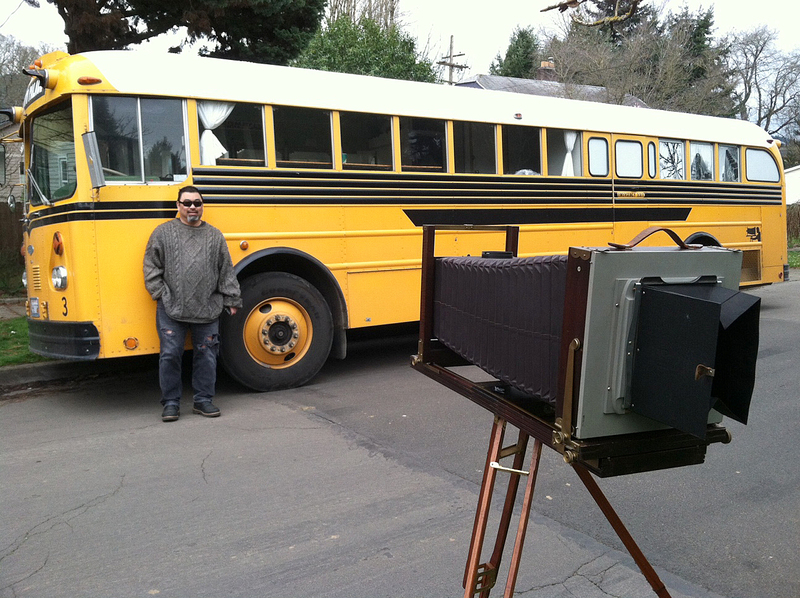 Now she teaches at Oregon State University and has invited The Photo Palace Bus to visit their campus in the role of a visiting artist. I was happy to have that opportunity and to reconnect with Julia. She is a wonderful artist and I admire that she works a lot with analog photographic means. Once, as a performance piece at a gallery, she even constructed a cardboard photo booth, hid herself in the and was processing images during the show! First off that project is not for claustrophobic people and it also shows dome serious dedication and love for gelatin silver prints. I highly recommend checking out her website and seeing the amazing amount of work completed over the years. Aside from being a prolific artist she is also a great host and her husband was a delight to meet as well. They are both originally from England and it was a relief to speak with someone who not only enjoys soccer, but also calls it by its proper name - football! When I got to OSU on Thursday morning I had a full agenda ahead of me. There were 4 classes that were scheduled to visit the bus and see the history of photography exhibit and I knew that I also would get a lot of people wandering into the bus because of its prominent location - right in front of the Art building. As I expected, I barely had a moment of rest. The classes were full of eager students and a big yellow bus did in fact pull in quite a few other pedestrians. Her is a shot of one of the students figuring out the working of a stereographic viewer. Among other memorable moments that happened during the roughly 6.5 hours at OSU, all of which I can not describe now as it is past midnight and I have a full day tomorrow, was my chance to meet Steve Anchell - the man whose book 'The Darkroom Cookbook' I have been using as reference for many years. Steve was very personable and down to earth kinda guy and even took me out to lunch. He did give me a very useful tip on how to cut down on the washing time for fiber based gelatin silver prints by using alkaline fixer and I believe I will do that as soon as I get my hands on that particular fixer. Steve is not only extremely well-versed in photo chemistry, but he puts that knowledge to use in making some great photographs. You can see those and a lot more information about Steve and his work on his site here. At the end of the day Steve's second class came in for a visit and he was kind enough to present me with a signed copy of the third edition of his famous Cookbook. During the course of the day a small team of two student journalists were sent from the OSU media department - one recorded an interview with yours truly for the radio and the other one took some great shots. As I don't have too many quality images of Gilli and me I did ask him to send some over my way and here is one of my favorites. After OSU was a Magic Lantern Show sponsored by Williamette Valley Photo Guild. 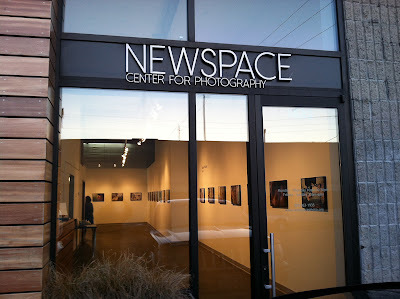 I think it went well and I only hope to be able to post some images from that event on here soon - Mitchel (the OSU photographer) did make it to the show and I can't wait to see his photos. The room inside of an old brick building was very much in tune to the event and I think that added to the show's atmosphere. 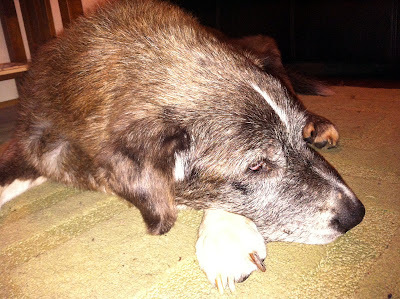 About 25-30 people attended and among them there was once again a member of the Rahill family. The grand-niece Faith Rahill lives in the area and blessed us with her presence. 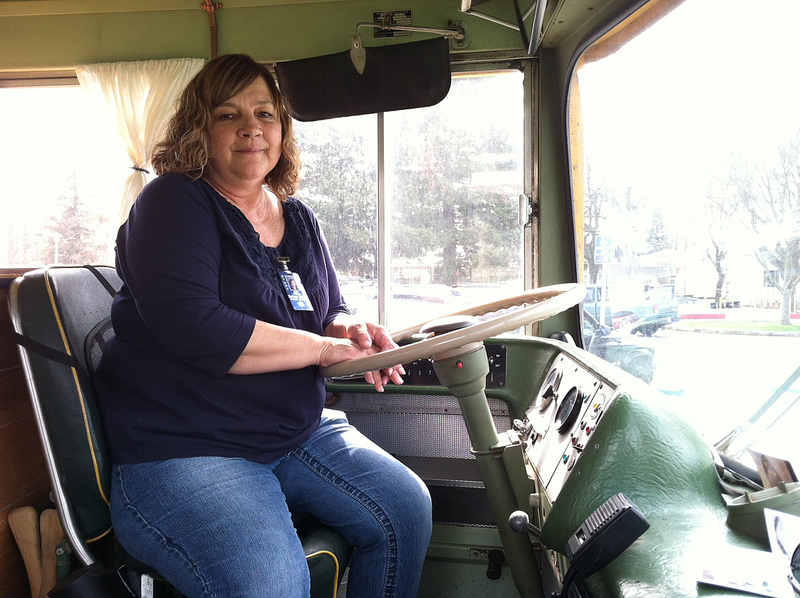 Her grandfather was John Rahill's brother and it was really cool to reconnect Faith with a part of her own family history. I think the show went pretty well, there were many remarks and questions from the audience and I'm always happy to have an engaged crowd. I did my best to get the show to fit in under 1.5 hours' time and I think I barely succeeded in that goal. Also fewer slides were inserted backwards or upside down, so that's a step in the positive direction. After yet another night in the comforts of Julia's couch I was off to Portland. There I met with another college friend of mine Perry. He graduated from SJSU just a semester earlier than me and the least time I saw him was in 2007, when he attended my little 'farewell USA' event during which I burned a large shark made from 100 paper plates before moving to Japan for a year. Perry is now in the middle of getting his MFA from Portland State University and he took me on a little tour of the little darkroom that is still in existence there. There are only 6 enlargers there and I don't know how a class can really work with that... 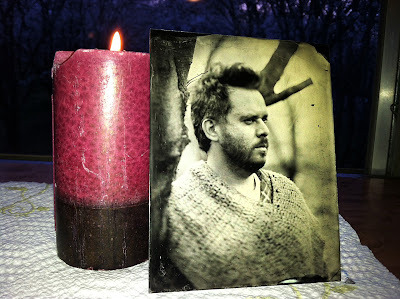 Here is the man himself and about 2/3 of the darkroom all in one shot. 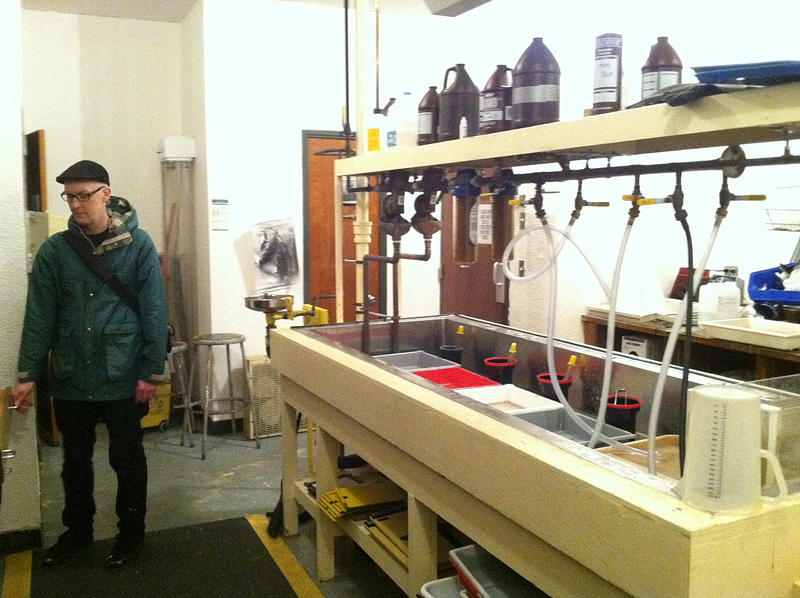 One thing I have been looking forward to on this trip was taking a wet plate collodion workshop with Ray Bidegain. 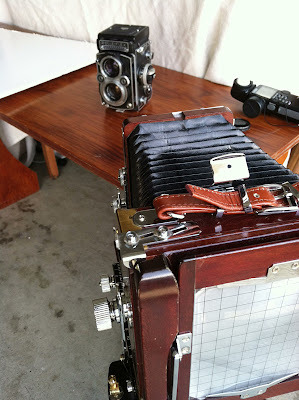 I met Ray on Facebook through another wet plate shooter by the name of Ted Mishima. 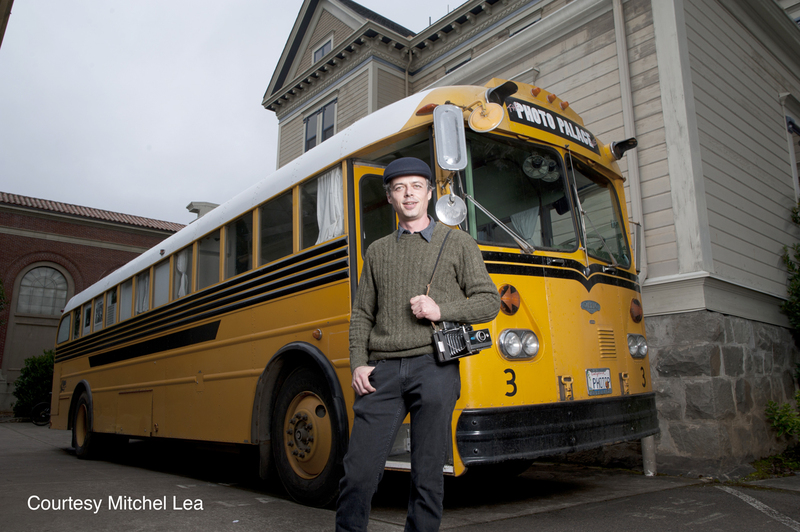 Ted shoots tintypes using a Rolleiflex TLR camera and posts some of them in the Rolleiflex users group. Seeing that he lives in Portland I asked him if he was able to show me the technique when I'm in the area, but he referred me to his mentor Ray. 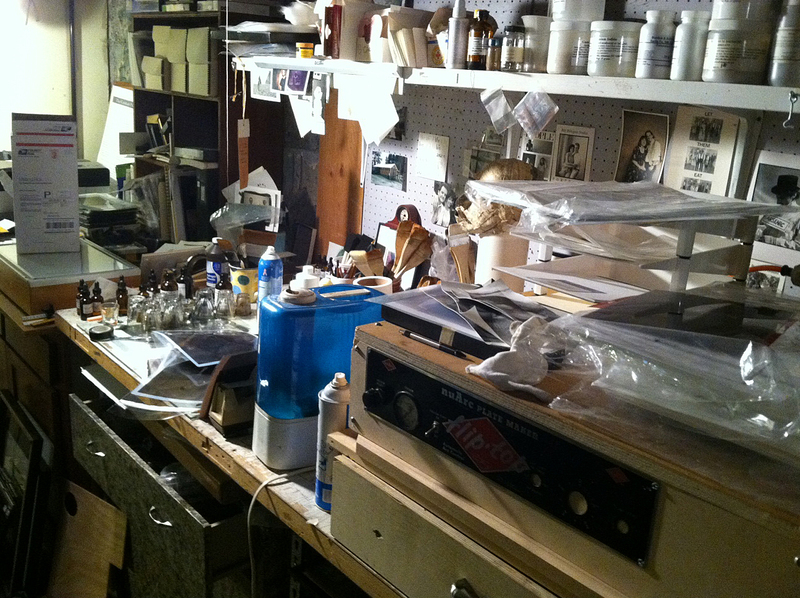 Ray is a platinum printer as well and offers workshops, which I very much recommend. 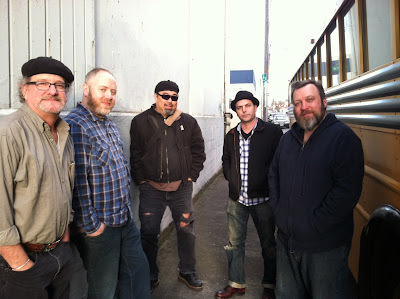 You can find the info about them on Ray's website. I could not wait to try my hand in that historic and beautiful process and when Saturday came around I was at Ray's door at 10am. 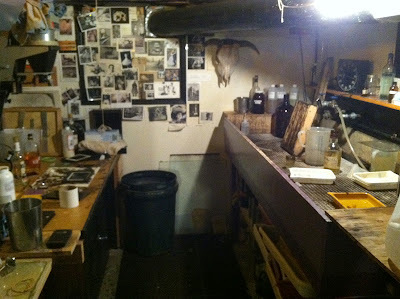 After a little bit of shuffling some cars out of the way of Gilli, I entered Ray's basement where a very efficient darkroom and photo storage area have been set up. 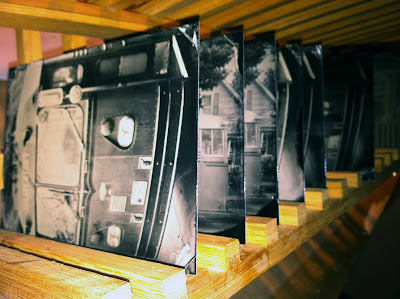 Here are a couple of quick shots to give you an idea of what a darkroom of someone heavily invested in alternative photography looks like. silvering tank that is used to sensitize plates. 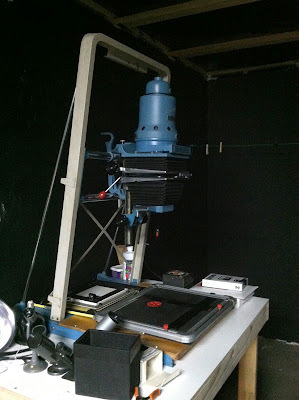 well built UV exposure unit for platinum prints. 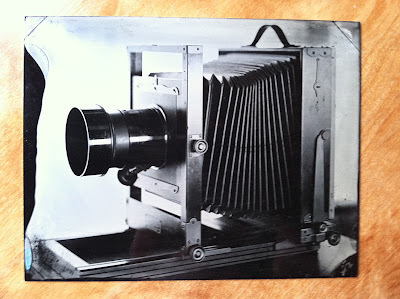 Wet plate process is by far easier to do than daguerreotype, which is why most photographers switched to it quickly after it was introduced in 1853. That said, it is still a VERY demanding process and it takes quite a bit of attention and skill to get a 'perfect plate'. First an aluminum or glass plate has to be coated with a viscous substance called 'collodion'. That step is tricky in that the action has to be smooth and flawless and there are certain movements and motions that have to happen rather precisely in order for the final result to be of any significant quality. After about 10-15 seconds during which one must keep swinging the plate in a vertical position to break up streaks the colldion sets (not dries, but becomes more viscous). It is then submerged into the tank containing silver nitrate for 3 minutes. That sensitizes the plate and so the red lights are switched on before it is taken out, wiped off to get the residual silver off and placed in the holder. You don't have much time at that point as the image must be captured and processed before that collodion dried out. In order for that to happen you must have your view camera set up and the model patiently waiting. 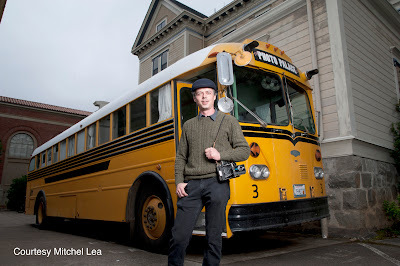 At first I was using the 4x5 camera and training my skills on the large, but beautiful model that is Gilli-the-bus, so there were no problems with the model getting impatient. After the plate is exposed in the camera it must be taken back into the red-lit room and flooded with developing solution - again a motion that will likely take me a few more tries to got good at. Developer acts quickly and you must judge the process by eye and only after 15 seconds or so, just as you see the milkiness of the shadow areas start to yield detail, rinse the developer off with water. Then the plate is placed in ordinary thiosulfate fixing bath and there the image is finally revealed in its positive form. Here is one of the very first plates from the workshop at the half-way point of clearing by fixer. Luckily Ted Mishima showed up right as I was starting to work with a larger camera and he was willing to guard the camera and even posed for a couple of pictures. Here is Ted leaning up against Gilli for support and my Kodak 2D with a 5x7 back on it. After a full day of work I succeeded in getting a few relatively good plates and here they are in the drying rack. Ray helped me mix my chemistry kit, sold me a few plates to keep me going through this trip and helped me fill up Gilli's water tank for the next day, so I can practice what I just learned. In the morning I woke up to a rather rainy skies, but that sis not deter me from trying my hand at this new-to-me process on my own. I set the Kodak 2D up on the table in the bus, pointed a 4x5 camera at it and went on to make 4 exposures in the course of about 1.5 hours (3.5 if you count this newbie setting up and breaking down all the needed equipment). Exposures with this process, which has an emulsion with ISO rating of approximately 1, were 3 minutes long - partly due to the fact that I was parked next to a wall and the light from an-already grey sky had to bounce off that wall to enter the bus window and possibly partly due to the fact that wet collodion works better in warmer temperatures and it was 48°F in the darkroom while I was working. I love all that is involved in making tintypes and can not wait to get better at it. For now you can see one of the better frames that I arrived at today at the top of this post. Now it is time for me to seep and I will finish the rest of the story of Portland, it's wet plate community and yet another Magic Lantern Show that I will give at Newspace for Photography this evening (in about 16 hours) some other time.